Pressed for time? 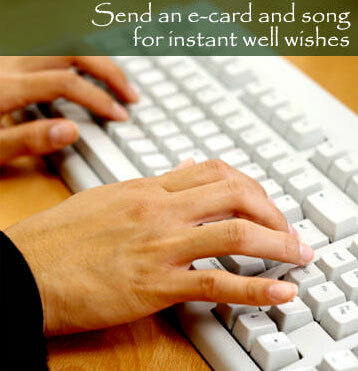 Select a card from our catalog, type your message and choose "Send this card now" by E-Card! Music plays a large role in most people's lives. Songs often provide touchstones for particular moments or memories. The gift of music can make a difference in someone's life, whether it be for a birthday, holiday or just to say, "I'm thinking of you." An original song, accompanied by a beautifully illustrated card with room to express your sentiment. SEND AN E-CARD TO A FRIEND THIS HOLIDAY SEASON! Celebrate birthdays, holidays, special events or any occasion With a Card and a SongTM. Unique musical greeting cards for friends and family.